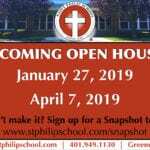 My husband and I could not be any happier with our children’s school than we are with Saint Philips. Our girls enjoy a challenging education in a beautifully caring environment. We are so thankful to have found this school! What I like about Saint Philip School is all my friends and teachers but my favorite thing is all the subjects. My favorite subject is science. My favorite experiment is when we used clay and covered pasta shells with vaseline. We stuck the pasta shells in the clay to make a mold and then filled it with plaster. All of my friends are so nice to me. I love Saint Philip School because it is such a faith filled community. Also, everyone is one big happy family that loves and cares for one another. We believe that St Philip School has provided our son with the best possible education. The Faculty and Staff at St Philips are extremely qualified and create a loving environment for our child to learn. The Parishioners of St Philips along with Father Frank are very supportive of the school and the many programs that they offer to help our children and family grow. We are so pleased with the school, faculty and staff that we have decided to enroll our 3 year old daughter into the New Little Cardinals Program next fall. We would love for you to come get a snapshot experience of our unique educational setting that educates the WHOLE child! Our tours are designed to provide guests with an introduction to our program that is structured around the complete spiritual, emotional, physical, and intellectual formation of every student. 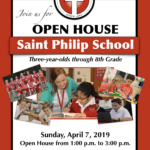 Saint Philip School makes quality education a reality as we teach truth, build community and inspire service as students grow confidently to their individual, spiritual, and intellectual potential. We are thrilled to announce a new collaboration between Saint Philip School and Bishop Feehan High School! The Partner School Early Action (PSEA) Program is unique in scope and may be of benefit to many of our school families.